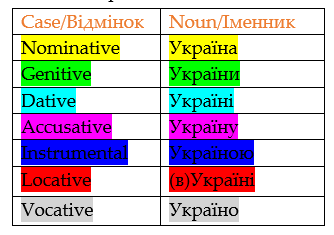 Cases in Ukrainian language means that the ending of nouns, adjectives and other words associated with those nouns change. If you have not been introduced to this concept yet, you have been learning words and phrases in their isolated pure forms. As you go deeper in learning Ukrainian, you will start seeing words that you think you know, but for some reason look different. Why did Україна turn to України? Я люблю Україну. – I love Ukraine. Україна turned to Україну. Слава Україні! – Glory to Ukraine! З Україною в серці! – With Ukraine in the heart! Україна turned to Україною. Зроблено в Україні – Made in Ukraine. Україна turned to Україні. Вперед, Україно! – Ukraine, go forward! (Ukrainian fans slogan)Україна turned to Українo. Well, that is because there are seven cases in Ukrainian which means that the ending of word changes depending on the situation you use the word. It might seem a little bit overwhelming at first, but in this article, I am going to explain what cases in Ukrainian are and give you some strategies of how you could learn them. My brother gave this little book to my big sister. So in this sentence “my big brother” is in one case, “thisu littleu booku” and “myi bigi sister” are in other cases. “My big brother” is the subject of the sentence, “thisu littleu booku” is the direct object and “myi bigi sister” is the indirect object, meaning the person that it has been given to. It looks completely absurd in English, but we have all of these cases in Ukrainian. 1. Ukrainians will understand you! Ukrainians will understand you, for the most part. And they will not judge you anyhow. They are used to foreigners struggling with the cases. Do not let cases scare you into not speaking Ukrainian! 2. Hungarian and Finnish have 15 or more cases! And if it is any consolation, be glad you are not learning Hungarian or Finnish, because they have 15 or more cases, while Ukrainian has seven. Look on the bright side! Here is a brief rundown of the seven cases in Ukrainian and some of the ways in which they are used. This case basically tells us the subject of the sentence. ‘Nominative’ in English comes from Latin ‘nomen’ or ‘name’ and in Ukrainian ‘Називний’ comes from ‘назва’, also a ‘name’. You can think of this as the ‘subject case’ or the case that the word is in when you look it up in the dictionary. Its Ukrainian name is related to the noun ‘рід’ (a gender, a generation). You can think of the Genitive case in Ukrainian as the equivalent to English ‘of something’. So ‘The Constitution of Ukraine’ – ‘Конституція України’. You can also use Genitive case to say ‘from something’ or ‘from somewhere’ because it tells you where it originates from. Another use of the Genitive case is like the English possessive construction with apostrophe ‘s to say that something belongs to someone. You also use Genitive case in negative sentences. The Ukrainian name for the Dative case is related to the verb ‘давати’ (to give). The dative case is very similar to English’s indirect object. So in the example ‘I gave the dog a ball’ dog would be the indirect object and would take the Dative case in Ukrainian. Its Ukrainian name is related to the verb ‘знаходити’ (to find). Accusative case in Ukrainian is basically the direct object (the noun that takes the initial action of the verb). To form simple sentences like ‘I love Ukraine’ – ‘Я люблю Україну’, you need to use the Accusative case. Its Ukrainian name is related to the verb ‘орудувати’ (to operate with, to handle with). The Instrumental case tells us how we do something or using what. In English, we use the word ‘with’ to describe this idea. Another use for the Instrumental case is to say that something is located above or under something. The Instrumental case is used with a preposition ‘з’ – ‘with’. In the phrase, ‘З Україною в серці!’ – ‘With Ukraine in the heart!’ we have the Instrumental case form. Its Ukrainian name is related to the noun ‘місце’ (a place). This case indicates the location of something. It is used only with a preposition. Зроблено в Україні – Made in Ukraine. ‘В Україні’ is the Locative case form. Its Ukrainian name is related to the verb ‘кликати’ (to call). You might be feeling overwhelmed right how. Well, the good news is that there are some strategies for learning the cases in Ukrainian to break them down and learn them bit by bit. You do not need to know everything at once. Just go forward. Actually, this is the way kids learn their native language. They just memorize the set phrases. They know how to get what they want but if you ask a little four-year-old kid what Dative case is he would have no idea. He just memorizes the set phrases and then he tries to experiment and say something new. Sometimes he gets it right, sometimes he gets it wrong. You can do the same thing. For example, you learned the phrase ‘Я люблю Україну’. You can walk around Kyiv saying that to everybody and they will think you are doing great. Eventually, something will click in your brain and you will realize: “Oh, Україна is the original version but when I say that I love it the ending changes to –у.” Then you can start trying new things with it. This is called inductive learning – you first see all the examples and then you figure out the rules going backwards. Many students like to color the lines in the charts. Then, if you go through your reading a text and you underline the Accusative case in red, and then the Dative case, and all others… your brain will start to separate those cases out from each other and start to make sense of them and it will give you sort of a visual representation. If you are a visual learner or you love charts, think of a way to use them in learning cases. 5. Every time you learn a verb or a preposition, memorize which case it needs. Do you want to speak Ukrainian? Subscribe to our Ukrainian Lessons Podcast and get free Ukrainian lessons every week! In 2013, Iryna graduated from Ivan Franko National University of Lviv and got a Master's degree in Philology. She specializes in the methodology of teaching Ukrainian as a foreign language. Iryna worked with students from the United States, Canada, Brazil, Germany, Italy, Estonia, Poland. She appreciates the opportunity of cultural and worldview interchange during the lessons. Iryna is interested in early learning methods as she has a little son.